In one of the deadliest school shootings in U.S. history, a gunman opened fire Friday in a Connecticut elementary school, killing nearly 30 people -- most of them children. President Obama wiped away tears as he spoke about the shooting from the White House’s briefing room. “Our hearts are broken today. I know there’s not a parent in America who doesn’t feel the same overwhelming grief that I do.” President Obama ordered flags to half-staff in tribute to the victims. This entire incident is a true tragedy. As Christians, we are called to faithfulness in prayer, especially when we are witness to tragedies involving violence. 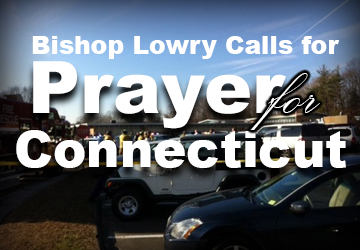 Bishop Mike Lowry asks the Central Texas Conference to be in prayer for the families and the entire Newton, Connecticut community who are grieving such a tremendous loss.